Contractors are often under pressure to open newly constructed pavements within days or hours after the work is completed. In the early 1990s, "fast-track" concrete mixes became part of the solution because they gain strength rapidly. These concretes, however, can be damaged severely if subjected to adverse weather conditions. In response to this problem, The Transtec Group, Inc., a private firm under the direction of the Federal Highway Administration's (FHWA) Stephen Forster, former technical director for Pavement Research and Development at the Turner-Fairbank Highway Research Center, worked collaboratively with academia, State departments of transportation, industry, pavement contractors, and materials suppliers to create the HIgh PERformance PAVing (HIPERPAV®) software program. HIPERPAV provides guidance on the design and construction of concrete pavements, helping users anticipate and prevent pavement performance problems. Recently the American Concrete Pavement Association (ACPA) selected HIPERPAV as the winner of its 2005 Marlin J. Knutson Award for Technical Achievement. ACPA presents this annual award to an individual or group who has made significant contributions that advance the development and implementation of innovative technical and best practice approaches in designing and constructing concrete pavements. Ensure a high-quality product at minimal cost. Optimize the design and temperature characteristics of a mix. Reduce uncertainties about long-term performance. HIPERPAV consists of two modules. The first module is for full-depth construction of jointed plain concrete pavement (JPCP). The second module is for bonded overlays. Each module consists of four input screens that define a project's construction, environmental, mix, and general design parameters. After the user defines all of these factors, HIPERPAV analyzes the inputs and presents a simple and easy-to-interpret graph comparing the stress and strength development of an overlay or pavement over the initial 72-hour period after placement. If the potential for uncontrolled cracking or de-bonding of the overlay is found, the user may change one or more of the input parameters in subsequent runs of the program until achieving an acceptable combination. Thus, potential problems are avoided before construction even begins. Currently, the module for bonded concrete overlays is being redesigned into a separate, standalone software named HIPERBOND that went through a considerable model validation phase in 2001. Figure 1. The HIPERPAV team is developing an enhanced output summary similar to the one shown here, for HIPERPAV II. In 2005, FHWA released HIPERPAVII. This expanded version contains many new features requested by users. HIPERPAV II also incorporates two new modules. The first module enables users to see the effect of early-age design and construction strategies on the long-term performance of JPCP. The second module predicts the behavior of continuously reinforced concrete pavements for the first days and months after placement. HIPERPAV II also includes the results from previous FHWA studies related to optimizing concrete mix designs and the early-age behavior of dowel bars in concrete pavements. Other improvements include enhanced materials characterization, additional flexibility in climatic input, and a redesigned graphical user interface that is more user-friendly and efficient. Although HIPERPAV II features many improvements over the original version of the software, the HIPERPAV project team currently is developing additional enhancements. This includes an innovative feature that enables users to simulate an entire day's placement with the click of one key. This feature also will enable users to generate and execute a factorial of strategies for different placement times throughout the day. In addition, the team is developing an enhanced output summary, as shown in figure 1, which will provide an intuitive means to visualize the results produced by the software. This summary also will show a window of caution that indicates when the stress-to-strength ratio in a pavement is greater than 1, an indicator that the pavement likely will crack. This article was adapted from an article originally published in FHWA's Research and Technology Transporter newsletter. The presence of moisture accelerates deterioration of hot mix asphalt (HMA), thereby increasing the risk of early failures, such as raveling, fatigue cracking, and permanent deformation. Moisture damage occurs when there is a loss of bond either between asphalt and aggregate or within the asphalt mastic. Past research and practice has shown that empirical tests do not predict performance accurately with respect to moisture damage in most HMA. Therefore, a systematic method is needed to better predict moisture damage in HMA by considering the fundamental properties and interactions of the asphalt binder and aggregate. Figure 2. 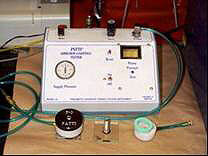 The Pneumatic Adhesion Tensile Testing Instrument (PATTI) is shown. To help address this problem, researchers at the Federal Highway Administration (FHWA) are using available computation models to characterize moisture damage at the asphalt-aggregate interface to assess HMA susceptibility to damage. In particular, FHWA, in collaboration with Delft University of Technology (TU Delft) in the Netherlands, has identified critical moisture damage-inducing processes. These include diffusion of water through mastic to the mastic-aggregate interface, advective transport of mastic, and mechanical damage. Researchers at TU Delft also have developed a finite-element tool known as RoAM (Raveling of Asphaltic Mixtures) that simulates the critical moisture damage-inducing processes. This research combines experimental methods, such as the modified pull-off test conducted at the Turner-Fairbank Highway Research Center (TFHRC), with numerical simulations produced by RoAM to verify the critical moisture-inducing damage process parameters. Figure 3. 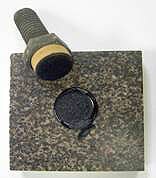 Pull-off test specimen on diabase stone after testing. Researchers at TFHRC have determined the adhesive tensile strength of the interface between thin film asphalt mastic and an aggregate substrate by conducting a modified pull-off test using the Pneumatic Adhesion Tensile Testing Instrument (PATTI), shown in figure 2. Figure 3 shows a specimen that has been tested in dry conditions, as evidenced by the loss of bond within the mastic film (i.e., cohesive failure). Experimental results of the PATTI test have been linked to moisture diffusion simulations using RoAM. Based on this combination of experimental measurements and computational analyses, the TFHRC researchers have established that bond strength degradation is a function of the amount of moisture at the mastic-aggregate interface. TFHRC researchers also have used the modified pull-off test method to evaluate the moisture sensitivity of Strategic Highway Research Program core asphalts, chemical- and polymer-modified asphalts and mastics, and high-performance materials such as epoxy asphalt. In addition, the researchers have used the pull-off test method to evaluate the healing properties of asphalt binder after moisture conditioning. Did we remember to put the lime in the mix? This question can be answered in 2 minutes using a very rapid technique known as Fourier-Transform Infrared Spectroscopy. To determine the presence of lime, take a sample directly from the paver by scraping a tiny amount of mastic from the aggregate and run the spectrum. The technique also can be used to check lime quality. In addition, quantitative estimations can be carried out. Figure 4 is the infrared spectrum of a mastic sample scraped from a hot mix asphalt containing lime. Figure 4. This is a picture of an infrared spectrum of asphalt mastic containing lime. Statistical quality assurance specifications containing incentive/disincentive provisions make contractors responsible for selecting the target levels of quality during construction. If the target quality is too low, contractors could receive a reduction in pay; if the target quality is too high, the cost to the contractors could be greater than any pay increase received as incentive for meeting targets. Contractors can select optimum targets to maximize construction profit when they understand probability and statistics and know the costs associated with quality. To date, however, many contractors lacked a reliable tool to help identify the most profitable quality targets. Some contractors simply target a level of construction quality established through intuition and experience. In addition, contractors that use a structured approach often fail to consider probability and assume that the results from acceptance sampling tests always will be an exact reflection of the actual quality of construction. To overcome these challenges, a tool-a procedure and accompanying computer program-has been developed to help optimize target quality. This effort was part of a University of Florida Ph.D. dissertation by Sofia M. Vidalis and was described in the paper, "Probabilistic Procedure for Analyzing Construction Pay Adjustment Systems," which was presented at the Transportation Research Board 85th Annual Meeting in January 2006. Vidalis' procedure serves two functions. Not only can contractors use it to set their quality targets for construction, but highway agencies can use it to validate their acceptance sampling plans. In other words, the procedure enables highway agencies to answer the questions, "What quality level are the specifications forcing our contractors to deliver?" and "Is this quality level in line with our agency's viewpoint of optimum quality?" Figure 5. Portion of the Prob.O.Prof input screen. Vidalis created the computer program Prob.O.Prof (which stands for Probabilistic Optimization for Profit) to analyze the American Association of State Highway and Transportation Officials' (AASHTO) 1996 quality assurance guide specifications for concrete paving. These specifications employ three acceptance quality characteristics that are tied to the contractor's pay-slab thickness, concrete strength, and surface smoothness. Portions of the Prob.O.Prof input and output screens are shown in figures 5 and 6, respectively. Figure 6. Portion of the Prob.O.Prof output screen. Using typical contractor costs and construction variables as inputs, Vidalis used the Prob.O.Prof approach to evaluate the current approach to developing targets, which assumes that sample quality equals population quality. In considering probability, Prob.O.Prof not only identified target quality levels that were slightly different than contractor optimums, but also showed that contractor net profits easily can vary by 30 to 50 percent between the two approaches. By using the Prob.O.Prof approach, Vidalis concluded that the AASHTO guide specifications force a fairly high level of quality. However, for the inputs considered, only the composite pay equations that are based on multiplying pay factors or adding pay increases or decreases are recommended for AASHTO. The other composite pay equations invariably result in negative net profits for contractors, which forces contractors to increase their bid prices to realize a profit. Can we use phosphoric acid to stiffen asphalt? When and where can it be used? What grades can be used? What happens if lime or an amine antistrip is used? What about different aggregates? These are some of the questions raised by State agencies that have prompted a lengthy and detailed research program at the Turner-Fairbank Highway Research Center (TFHRC) on the use of acids to modify Superpave® binders. Although work on this program is underway and the work plan for this research is very extensive, researchers already have made significant progress relating to the use of phosphoric acid. Phosphoric acid is available commercially in different strengths. Weaker grades contain more water, and stronger grades contain molecules joined together as polyphosphoric acid. A crude grade of "green" acid also is available. This crude grade, which is made by digesting phosphate rock with sulfuric acid, contains 50 percent phosphoric acid and 2 percent residual sulfuric acid. When digested in hot asphalt, all grades of acid lose water. Studies using nuclear magnetic resonance imaging (31P NMR) indicate that some polyphosphoric acid is generated from the weaker acid grades (that contain no polyphosphoric acid themselves) after digestion in hot asphalt. The TFHRC researchers have found that all the commercial grades of phosphoric acid (50-, 75-, 85-, 105-, and 115-percent) increased asphalt stiffness when added at levels of 0.25 to 1.0 percent. The amount of stiffening, as measured by G*/Sinδ at 64 °C, increases linearly with the amount of acid. The degree of stiffening, therefore, is asphalt-dependent. Asphalt AAK-1 (Boscan PG 64-22) showed the steepest increase in stiffness when acid was added, and ABM-1 (CA Valley PG 58-10) showed no change. Asphalts AAM-1 (West TX Int. PG 64-16) and AAD-1 (CA Coastal PG 58-28) were between the two extremes and similar to each other in their response when acid was added. The addition of crude green acid to asphalt led to the greatest increase in stiffness, possibly because it contains 2 percent of sulfuric acid impurity, which is a much stronger acid than phosphoric acid, but is likely to lead to tank corrosion issues. In response to a recent laboratory assessment by our outside partners, FHWA's Office of Research and Development's (R&D's) Pavement Materials and Construction Team has developed this informal, electronic publication to provide updates of ongoing research activities. We hope you find it informative and useful. Visit our Web site at www.TFHRC.gov. NOTICE: This document is disseminated under the sponsorship of the U.S. Department of Transportation in the interest of information exchange. The U.S. Government assumes no liability for its contents or use thereof. The U.S. Government does not endorse products or manufacturers. Trade or manufacturers' names appear herein only because they are considered essential to the objective of this document. QUALITY ASSURANCE STATEMENT: The Federal Highway Administration (FHWA) provides high-quality information to serve Government, industry, and the public in a manner that promotes public understanding. Standards and policies are used to ensure and maximize the quality, objectivity, utility, and integrity of its information. FHWA periodically reviews quality issues and adjusts its programs and process to ensure continuous quality improvement.